Tomorrow, Sunnyside Christian School becomes a bustling, busy, living tradition. It’s the day before Thanksgiving, which means school gets out at noon. But before that, several traditions will take place. First, family and friends will fill the folding chairs in the gym in anticipation of Thanksgiving Chapel. Soon after, the students will begin to file in, first stopping at the row of tables flanking the east wall. As the students file through, the tables fill up with non-perishable items which will be donated to the Union Gospel Mission in Yakima. Flour, canned beans, sugar, canned corn, tomato soup. The Mission won’t be surprised to get all the items because this has happened every Thanksgiving Chapel for over 40 years. They won’t be surprised, but they’ll be blessed and very thankful. After chapel, it time for the third grade tradition. For weeks, they’ve been working on decorating their classroom with Native American art including a paper mache canoe, a paper teepee, sand art, and much more. Folding chairs replace the desks in their classroom. It’s time for them to tell the story of the pilgrims coming to America. They put on their hats and feathers. Some are clad in brown leather and moccasins, while other have on black pants and white shirts. The baby dolls are carried in laundry baskets, and Squanto makes everyone laugh. After the performance, Mrs. Martinez plays the piano while they sing a Thanksgiving hymn. Meanwhile, in another room, parents are decorating a long table with enough plates, cups and snacks for every first and second grader. It’s time for The Feast! Each second grade pilgrim matches up with a first grade Native American, and together they share a yummy snack. It’s their version of the Thanksgiving meal, with popcorn balls and beef jerky. Even though these events happen each year, it never gets old. It’s something that connects us to this community of Sunnyside Christian School. Can it be true that 25 years ago, I put on my feathers and played my part in that third grade play? I remember being up to my elbows in paper mache making that canoe. I’m thankful for traditions. 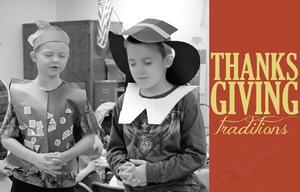 I’m thankful for the teachers that continue to work hard to educate our children about Thanksgiving and the way of life of pilgrims and Native Americans. And I’m thankful that the play ends in a God-glorifying hymn and that The Feast begins with a shyly spoken prayer by a brave 2nd grader. To God be the glory! Thanksgiving is next week. It amazes me how little attention this holiday receives. Businesses seem to move their merchandise from Halloween to Christmas without a blink. Stores are now open on Thanksgiving Day only trying to win over more customers for the Christmas sales. It seems we are so busy that we rarely slow down enough to reflect on the blessings we have. When we take a moment (or how long would it really take?) to count our blessings, we should be overwhelmed with gratitude. We have homes in which to live, children to love, and our needs met. Above that, God has enabled us to provide a Christian education for our kids. We have health and strength to do the work God has called us to do. But He goes a step further. God has given each of us the greatest gift we could ever receive. The God of the universe loves each of us individually, and He desires a personal relationship with us. He has the time to hear our concerns and worries, and He provides sources for encouragement and strength. 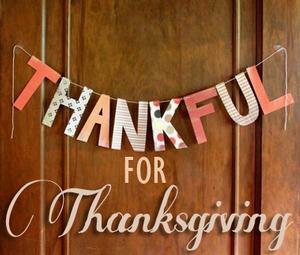 The official Thanksgiving holiday is only a few weeks away, but the Christian’s celebration of Thanksgiving should be happening everyday. So in the busyness of your day-to-day responsibilities, take time to reflect on how you have been blessed. Recognizing all of our blessings is a great source of encouragement. We at SCS are grateful for the support and encouragement from all our constituents. In the Toward Christian Adult Living (TCAL) class that Sunnyside Christian High School offers senior students, we examine relationships, especially why the popular culture, although constantly searching, cannot find and maintain lasting relationships. Although we have explored extremely helpful information with previous seniors at SCHS, this year I introduced another angle, a dimension shared by Chip Ingram in a series he presents on love and lasting relationships. Mr. Ingram contrasts two views of approaching “romantic” relationships, and he identifies these as Hollywood’s prescription for lasting relationships as opposed to God’s prescription for lasting relationships. After establishing that almost all North Americans have been “disneyized” and “buy in” to either to a lesser or greater degree of Hollywood’s formula, he passionately explains the absolute opposing views of these two prescriptions. One has to find the absolutely “right” person, and he (or she) had better be on the hunt until he does. One “falls” in love through some magical, mystical way. One fixes his hopes and dreams of the present/future on that person-the new find is so special that he will alleviate all your problems. When failure occurs, repeat Steps One, Two, and Three to maintain this endless cycle. I could certainly expand on each of these points to reinforce how anti-Biblical they are, but you get the point. Become the right person. Focus on developing Godly character and learning to live the fruit of the Spirit. Walk in love. Live out your obedience to Christ as you develop Godly character. Fix your hope on God and seek to please Him through any relationship. If failure occurs, repeat the previous three steps focusing on developing a Christ-like attitude. Certainly, I could expand on numerous details for each of the previous points to reinforce their importance, and if you would enjoy learning more, please ask, and I will share more information on the ideas or the curriculum by Chip Ingram.